A mild climate which can be enjoyed throughout the year. A range of guest houses, bed and breakfasts, small hotels and inns. They are good quality guest houses often in historic local buildings chosen for their charm and welcome. Where possible we choose bed and breakfasts which have a 4 star AA or Enjoy England rating. All accommodation is on a B&B basis. Please book early to ensure that we can secure our first choice accommodation. 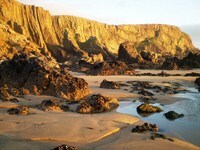 North Cornwall's Atlantic coast is a dramatic and beautiful section of the south west peninsula of England. The rugged and sheer cliffs, as well as the picturesque fishing villages makes this one of the most enjoyable sections of the South West coast path. The walking is varied, each day enjoying new experiences from beautiful sandy bays to secluded inlets harbouring quaint villages and from exposed rocky headlands to sand dunes and the wide Camel Estuary. Your self guided walking holiday starts at the bustling seaside resort of Bude before embarking on a journey through wild coastal scenery. 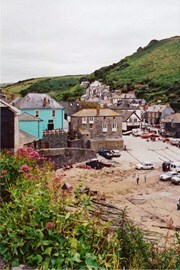 Highlights of your walking holiday include some towering sheer cliffs including High Cliff, which at 223m is the highest coastal cliff in Cornwall; a number of well-preserved small fishing ports and villages, such as Port Isaac and Boscastle, located in secluded bays of sinuous inlets, away from the fury of the Atlantic ocean. Their white-washed cottages with slate roofs, line attractive, twisty lanes climbing the narrow coves, making for an idyllic scene. 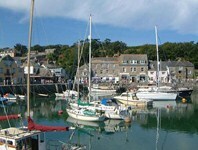 Either side of the attractive and busy medieval fishing port of Padstow on the Camel Estuary is a series of dramatic headlands which provide great views along the coast. Some of these sites such as the Rumps are the sites of Iron Age forts and other historic monuments. If you choose the option with five walking days you can decide whether to catch a bus to the bustling surf capital of Newquay or return to Padstow for your final night's accommodation. This walk can be enjoyed out of season thanks to the mild Cornish climate, when the tourists have disappeared and you can enjoy the beautiful villages and sites by yourselves. 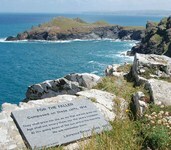 This independent walking holiday covers a reasonably challenging section of the South West coastal path. The overall walking holiday is graded Moderate to Challenging. Despite the relatively moderate distances involved - between 15km and 20km per day, the amount of ascent and descent is considerable, with an average of over 900m each day. The maximum ascent and descent in any one day is 1230m. The walking ranges from some easy level walking to strenuous ascents and descents on steep ground with paths which in places are narrow or on rough and muddy ground where you need to be sure-footed. Walking experience on hilly terrain is advisable. Although there are no easy days it is possible to catch the bus in certain places to shorten the days. Welcome, and night at Bude. Explore this attractive seaside resort with its canal and a favourite spot with surfers and holiday makers. This independent walking holiday in Cornwall includes a range of guest houses, bed and breakfasts, small hotels and inns. They are good quality guest houses often in historic local buildings chosen for their charm and welcome. Where possible, we choose guest houses which have a 4 star AA or Enjoy England rating. All accommodation is on a B&B basis. Please book early to ensure that we can secure our first choice accommodation. Below you'll find an example of the type of guest house we use. Train journey from London Paddington or Waterloo to Exeter. Stagecoach run buses betweeen Exeter and Bude (6 & 6A). 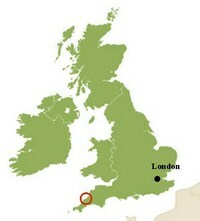 The bus journey takes about 1hr 50, whilst the train from London Paddington to Exeter St Davids takes just over 2 hours. There is a regular bus service between Padstow and Bodmin Parkway rail station which takes about 50mins and is run by Plymouth City Bus (11A). It runs roughly once per hour. Trains from Bodmin Parway to London Paddington take about 4 hours (with some departures requiring a change of trains). Newquay has a rail station. Journeys to London take upwards of 5 hours, with changes at Par and sometimes at Plymouth.